The construction of a private house always begins with the preparation and pouring of the foundation. 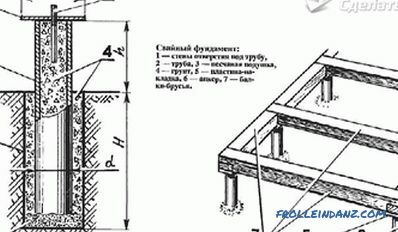 Arrangement of the foundation of the house - one of the most important and crucial stages of construction, it requires maximum attention and thoroughness in the work. 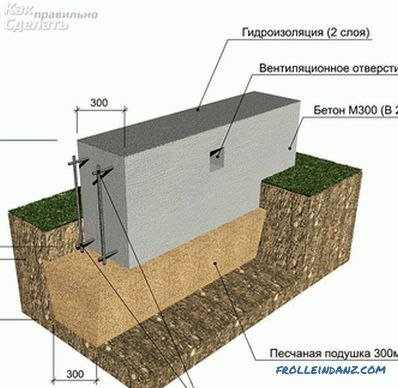 In this article we will talk about how to fill the foundation under the house with your own hands, we will show diagrams, photos and video instructions. For a certain type of building, this or that type of foundation is suitable. For example, piling is necessary in the case when the ground on the site is weak enough to organize in it other types of foundation of the house. 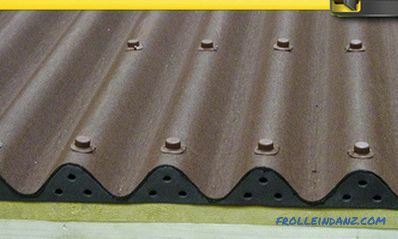 The strip foundation is good in that it can be equipped in most types of soil without unnecessary preparatory work. 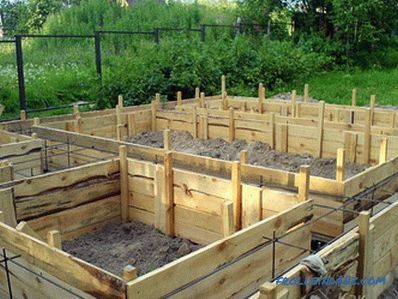 In the presence of "floating" soil - sand or so-called quicksand, it is recommended to use a solid, or slab foundation. For most erected country houses a strip foundation is chosen. 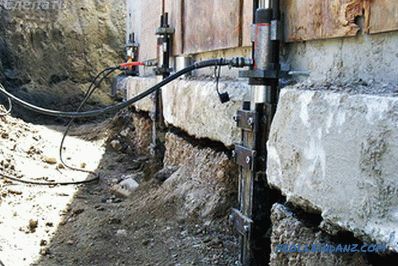 Preparation before pouring the foundation under the house is of great importance. At this stage it is necessary to make the layout of the area under the base of the house according to the drawing made earlier. The depth and thickness of the foundation, its location on the site depends not only on the terrain, but also on the composition of the soil. For example, swampy or clayey soil requires a pile foundation, unstable soil - a monolithic base, and a strip foundation is suitable in the presence of mixed soil. The marking is carried out with the help of a rope and pegs. 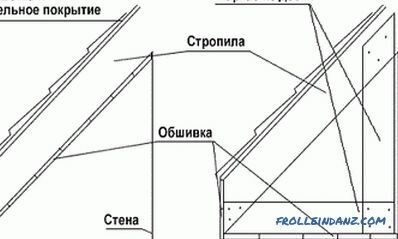 Having chosen the necessary type of foundation and having carried out the marking according to the drawings, one can proceed to the organization of the holes for the foundation. 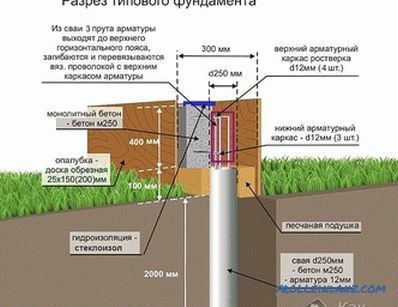 For the pile foundation with round-shaped piles it is necessary to use a manual or electric drill, a tape one - with a shovel and a drill, if it is not possible to use special equipment. To obtain a solid foundation will need a powerful construction equipment. After marking the site, you can begin to organize the holes for the foundation. For greater strength, their depth should be below the level of soil freezing. 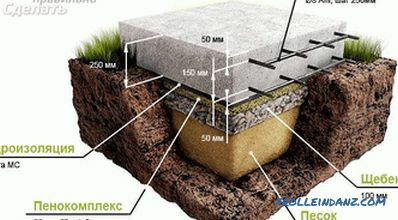 After pouring the foundation is usually settles, and to prevent cracking or any other deformation of the base of the house, you can build a sand pillow in each hole. To do this, the ground at the bottom of the hole should be compacted, sprinkle about 15-20 cm of sand on top, spill it with water and also compact it. 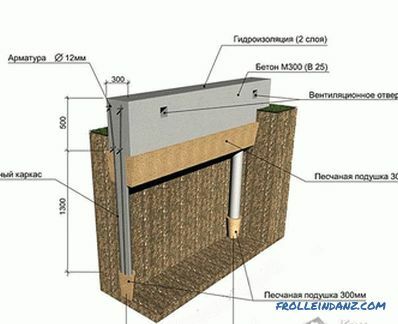 The amount of the concrete solution for the pile foundation can be calculated as follows: support area (bottom one hole) multiplied by the height of the pile. The support area of ​​one pillar is the fourth part of the diameter of the hole made in the ground in the square, multiplied by 3.14 (1 / 4πD 2 ). The height of one pile is the sum of the depth of the hole and the length of the pile that will be above the ground. Concrete mortar must be prepared from cement of a grade not lower than M200 . However, a truly solid foundation of the house can be obtained only with the use of cement brand M400. Attention should be paid to the quality of the sand - it should be fine-grained, without large stones. For a high-quality concrete solution, it is necessary to mix cement, sand, crushed stone and water in a proportion determined by the brand of cement used. It is necessary to prepare a concrete solution in such an amount that it does not remain after the completion of construction work. First, the hole is filled to 10-15 cm. The fittings are placed in it - a metal pipe or several metal rods with a thickness of at least 1 cm. 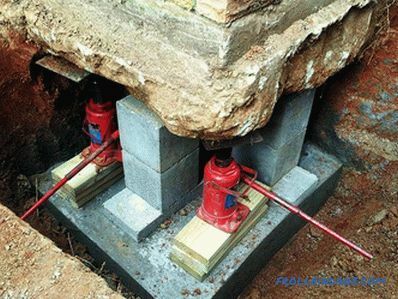 The reinforcement will give the foundation additional strength. After placing the reinforcement in the prepared holes, the concrete is gradually poured to the very top. When arranging the strip footing, trenches are installed on the previously marked territory that are deep below the freezing level. Their width should be no more than 50-60 cm. Before filling the foundation, a sand cushion should be settled - at least 15-20 cm thick; it should be spilled with water and well rammed. 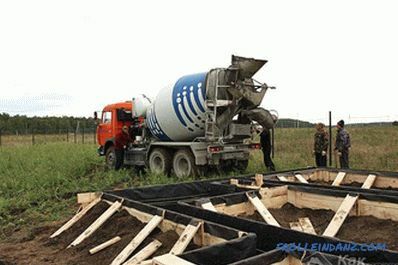 The first portion of the concrete mortar is poured at the bottom of the foundation - no more than 10–20 cm thick. 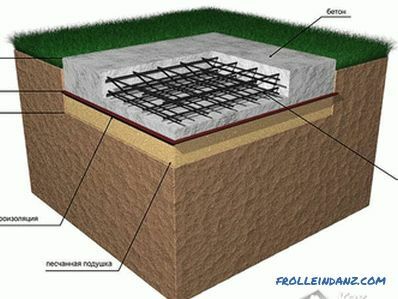 A reinforced mesh is laid on the primary mortar, and the concrete mortar is poured from above to the surface of the soil. 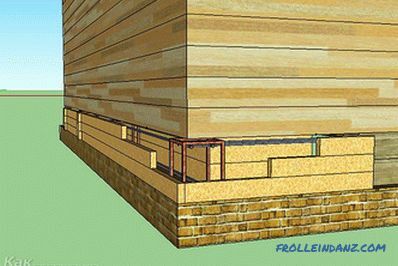 If the strip foundation must project above the ground, it is necessary to build a formwork of wooden boards in advance. Concrete solution must be poured into the formwork. 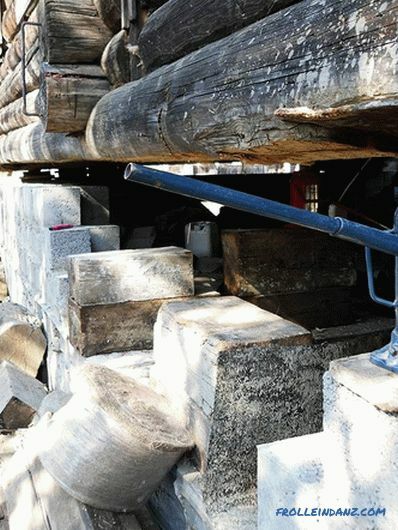 Wooden formwork boards can only be removed after the concrete solution has dried. When pouring concrete into the formwork, you must attach it to the inside of the wooden shields waterproof film - it will prevent water from the solution from being absorbed by wooden boards. If you live in an old country house, then you probably know that it needs to be repaired from time to time. Poor work on the arrangement of the foundation and poor materials can lead to a violation of the integrity of the house. And what if your house has no foundation at all? 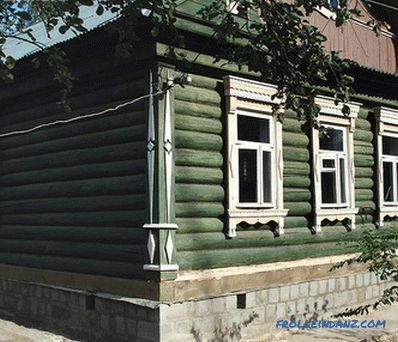 This problem is typical for houses made of wood. Anyway, we suggest you to familiarize yourself with the instructions for pouring new or replacing the old foundation for a house that has been built for a long time. 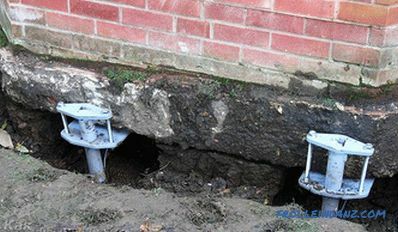 If you need to fill the foundation and under the inner walls of the house, you will have to crawl under the structure. But if the size of the house is not so large, and its weight is moderate, then it is enough to fill the foundation around the perimeter of the building. The depth of the pit for the foundation in this case should be two bayonet spade. 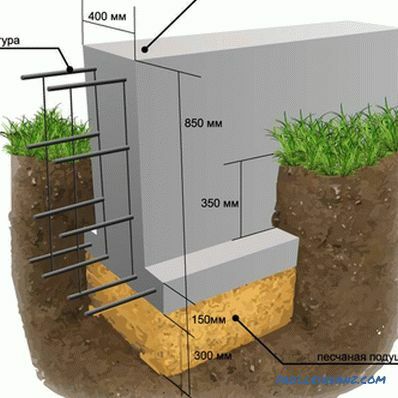 In the final analysis, the foundation under the old house turned out to be quite strong, in the trench / foundation pit, you must install supports at a certain distance from each other so that on one side they rest against the foundation of the pit, and on the other - at the base of the house. 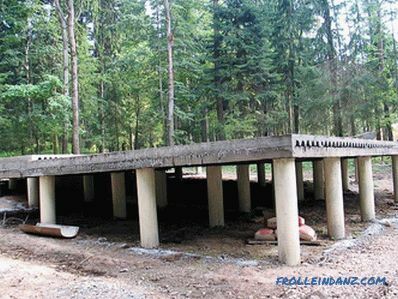 As such supports, you can use reinforced concrete or wooden columns. 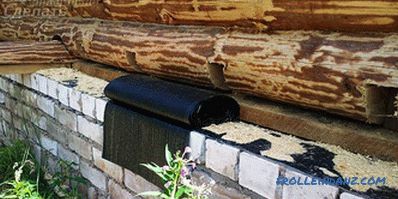 Whatever type of pillars you choose, it is important to waterproof them. This can be done with the help of special materials or chemical solutions. This is done to protect reinforced concrete from destruction, and wood - from rotting, due to exposure to these materials of high humidity. The width of the excavation depends on the size of the columns / support columns. 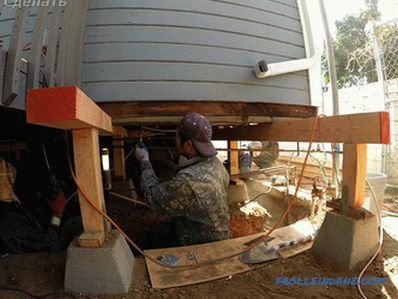 After installing the supports, you can proceed to the device of the bottom of the foundation. Cover it with sand. Spend tamping sand pillows. At the same time its thickness should be about 10-15 cm. This thickness is sufficient for even distribution of the load from the foundation to the soil. Comply with this condition is important, because poor-quality production of sand pillows can lead to cracking and destruction of the finished foundation, which is under the weight of the house. For a good tamping of sand, it must be shed with water. 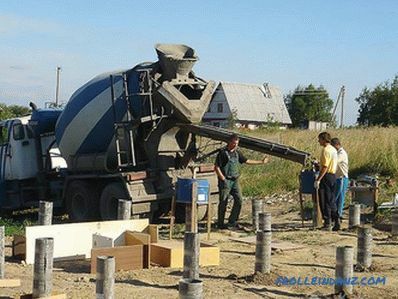 However, before pouring concrete, you need to wait for the sand to dry. Well, or tamp it by hand, but note, wet sand is easier and faster rammed. 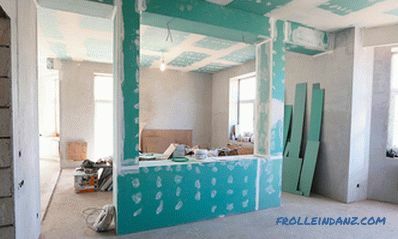 If you need to make a basement and under the inner walls of the house or partitions, you will also need to dig trenches, install supporting pillars and make a sand pillow. In the next step, you need to install the formwork. This is done from the inside of the outer foundation. To do this, you will need edged boards having a thickness of approximately 2-3 cm. You can replace the boards with a sheet of plywood or chipboard. 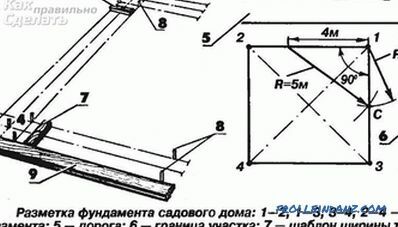 From one of the proposed materials you will need to make the walls under the formwork. Cutting boards / fanuri / chipboard. 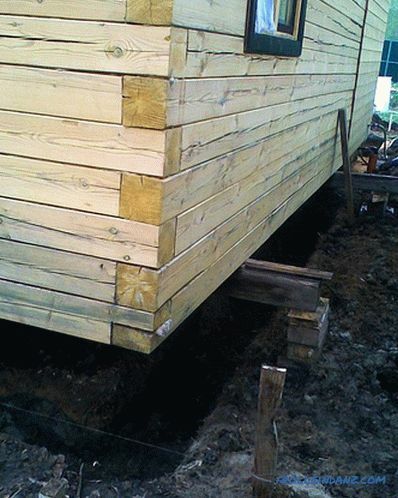 You can not just install wooden boards (or of chipboard / plywood) formwork in the ground, as these actions will not allow you to make durable limiters. Under the pressure of concrete such formwork will quickly collapse. Fix the formwork can be using metal racks. They will hold the design. It is important to arrange them at the corners. 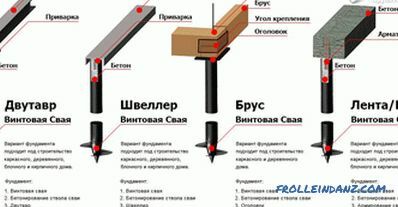 Another option for the manufacture of formwork - to combine several of its parts into one. This can be done with screws and screwdrivers. Leave some distance or manhole on one side of the foundation. With it, you can pull out the walls of the formwork at the completion of pouring the foundation and solidification of concrete. But, if in the future the formwork is not useful to you, then you can leave it in the foundation for good. The foundation must be poured taking into account the groundwater level. They are known to have a devastating effect on this part of the house. Therefore, it is important to ensure that the level of groundwater in your home does not rise so high during the melting snow and rainy season that it can undermine the base of the house. If you left a manhole in the basement, then after completing all construction works, you need to decorate it. This can be done in different ways. For example, install a sash that will allow you in the future if you need to get under the floor of the house.Or build a bed in front of the manhole, which will block this hole in the foundation. After installing the inside of the formwork, reinforcement of the foundation should be carried out. 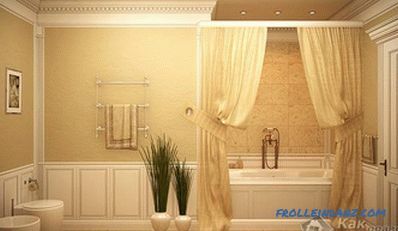 This event will help strengthen the base of the house, so that it will become more durable and reliable. 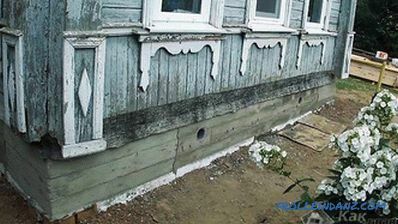 Some experts argue that it is unnecessary to reinforce the foundation of a wooden old house, because the concrete and the supporting pillars will already create a fairly solid foundation. But if you do not want to return to the issue of repairing the foundation for a long time in the future, it is better to do reinforcement. 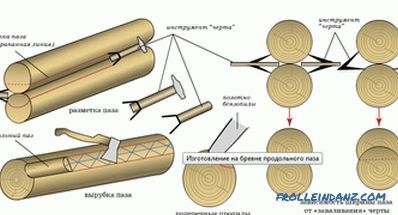 In order to maximally strengthen the foundation, connect the armored belt with the previously established supporting pillars of the structure. Steel wire, wire mesh, metal rods, steel mesh or wire rod can be used as a reinforcing material. Alternatively, fittings of suitable length can be used. After that, you need to build and install the outer side of the formwork. In the manufacture of formwork of edged boards it is likely that the concrete can pour out through small cracks. In order to avoid such a situation, enclose the shield with two layers of plastic film. It can be fixed to a wooden shield with a construction stapler. The crushed stone of the fine fraction should be poured into the pit. This must be done in view of the fact that the stone of a large fraction leads to the fact that the solution penetrates into the armored belt unevenly, as a result of which the quality of the casting suffers. This will lead to a deterioration of the strength characteristics of the foundation, and of the house as a whole. It is very important to do all the work conscientiously. As you fill the formwork with concrete, it is important to seal it, although This will not be easy, since there will not be such a big gap between the surface of the earth and the house. Carrying out these works requires patience. If your quality is poorly developed, then it may be worthwhile to consider other types of foundation construction for an old house. You already know what the pile foundation is. Of course, the process of installing piles for a finished house is slightly different from making such a foundation for a house that has not yet been built. In our case, screw piles should be installed around the perimeter of the house, right under its base. Installation of piles is carried out as follows: piles are gradually screwed into the soil. This is done before installing the piles in a dense layer of soil. Support posts need to be concreted. They are installed at the base of the house. Then the building with the help of jacks lift and set on piles. This type of foundation is made easier by the previous version, and even workflow takes much less time. However, the choice in favor of the pile foundation can be made only if it is a question of its manufacture under a small-sized house structure. A solid foundation of the house will be a guarantee of its durability, and, therefore, reliability. Of course, to write about how to fill the foundation is easier than to perform this task. But it is worth noting that even though this is a laborious process, it is quite doable.